Baba Gurbachan Singh was the last major Sikh Resistance leader to fall. The Indian Govenrment had put a RS 25 lakh reward on his head and was searching the entire Tarn Taran area for him, conducting 45 raids at one time to trap him. Baba Ji escaped each time and continued to be a painful thorn in India’s side. When all the other Singhs had been martyred and the entire Indian Security Force was on his trail, he refused the order to go and hide in Pakistan and spit on the offer to surrender. He simply could not be caught. Even in the end, he was martyred not by police bullets, but by the betrayal of those he considered his own. 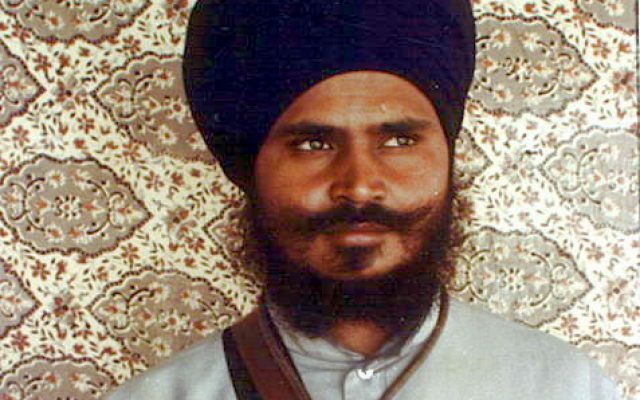 Baba Gurbachan Singh Manochahal was born on June 6, 1954 at village Manochhal in Amritsar district. His parents were Bapu Atma Singh and Mata Gurmej Kaur. His parents were simple farmers but their family had a heritage of struggle against injustice. Bapu Atma Singh’s uncle had become shaheed in the Jaito Morcha, marching against the British Raj. Baba Gurbachan Singh was from childhood a very strong and muscular boy. He enjoyed wrestling and other sports. The family moved from village Manochahal to Naushera Pannuan when Baba Ji was still young because his mother’s brothers had left for Singapore and left behind a large farm that had to be maintained. After that day, the nickname “Baba” stuck and everyone began to call him Baba Gurbachan Singh. In the entire area, people began to know him as “Baba Ji”. Baba Gurbachan Singh completed his education and at his father’s wishes, decided to join the army. Baba Ji was 6”1 and over 200 pounds. The army happily enlisted him as an “A level” recruit. Even in the army, the name “Baba” Gurbachan Singh stuck. He was known for doing paath and being a devoted Sikh, even though he was not yet Amritdhari. Every day he dedicatedly did his nitnem. One day, as Baba Ji was doing nitnem, he fell into deep samadhi (meditation). The time for the daily military parade came and went and Baba Ji had no awareness of it. The officer in charge of the parade demanded to know where Baba Gurbachan Singh was. The other soldier tried to explain that he was meditating but the Hindu Officer had a bias against Sikhs and refused to understand. The officer went to Baba Ji and shook him into awareness. Baba Ji apologized for missing the parade and explained he was reciting Gurbani. The officer responded by making fun of the Sikh faith and insulting the Gurus. Baba Ji’s anger couldn’t be controlled and he tackled the officer. His fists flew and the officer shrieked for someone to help him. The other Sikh soldiers watching did nothing as they knew how much the officer hated Sikhs. The beating continued for some time when finally other officers came and stopped Baba Ji. Baba Ji had broken the Hindu officer’s arm and his nose. Baba Gurbachan Singh was arrested and court martialled. After a year of prison, Baba Ji left the army and returned home with a desire to dedicate his life to Sikhi. Although Baba Gurbachan Singh did nitnem and had a love for Sikhi, he was still not Amritdhari. Baba Ji always attended programs by various Sants and one day he found out that Sant Kartar Singh Bhindranwale would be coming to his village for a program. Baba Ji was very moved by the katha and wanted to speak with Sant Kartar Singh. Sant Ji encouraged him to become Amritdhari and so Baba Ji did so within just a few days. After receiving the gift of Amrit, Baba Gurbachan Singh decided to travel with Jatha Bhindra(n). He became very close to Sant Kartar Singh and also learned Gurbani Santhiya and Katha. Baba Ji had memorized many banis and had a very long daily nitnem which he began very early at Amrit vela. After the passing of Sant Kartar Singh, Sant Jarnail Singh became the next jathedar of the Jatha and Baba Ji was also very close to him. On April 13, 1978, the Nirankaris had a march through Amritsar in which slogans against the Sikh religion were shouted. Singhs from the Akhand Kirtani Jatha and Jatha Bhindran marched peacefully against the Nirankaris but were brutally attacked. 13 Singhs were martyred and many more were injured. Baba Gurbachan Singh had also taken part in this march and was shot in the arm. When the Nirankaris continued with their insulting parchaar and were protected by the Indian Government, the Singhs began to punish the Nirankaris themselves and Baba Gurbachan Singh also wanted to join this movement. When he asked Sant Jarnail Singh for permission, Sant Ji kept saying that Guru Sahib was to take a very big seva from him yet. Sant Jarnail Singh asked Baba Gurbachan Singh to return to his village of Naushera Pannuan and direct the building of Gurdwara Baba Dhanna Singh Kaviraj there. Baba Ji accepted this hukam and returned to his village, but visited Sant Ji regularly even after. When in 1982, Sant Jarnail Singh Bhindranwale had gone to Bombay, the Indian Government thought it was the perfect time to capture him. The police surrounded the area and when Sant Ji received word of this he thought of a clever ruse. Baba Gurbachan Singh, who had been traveling with the Jatha, was about the same height as Sant Ji and wore the same style of clothes. He covered his face and lay down in Sant Ji’s bed so those watching would be fooled. Until Sant Ji had made his escape, Baba Gurbachan Singh continued to lie in bed and when he finally got up, the government agents were shocked and disappointed that their opportunity to arrest Sant Ji had passed. The Gurdwara in Naushera Pannuan where Baba Ji did seva was regulary visited by Singhs serving in the Movement. As the days of the attack seemed to be drawing nearer, Sant Jarnail Singh Bhindranwale sent a message to Baba Gurbachan Singh for him to come meet him at Sri Darbar Sahib. Baba Gurbachan Singh was waiting for the opportunity. Sant Ji met Baba Ji very warmly and told him that an attack on Sri Darbar Sahib was imminent. Baba Ji requested that finally this time his seva should be accepted and he would join Singhs in defending the Complex and become Shaheed. But Sant Ji knew that this Singh would one day be a General that would shake all of India. Sant Ji said that not all the Singhs should be Shaheed in the attack. That after the attack the struggle must continue and it would no longer be a struggle for greater water rights or concessions from the Center, it would only be for independence. For Khalsa Raj. Baba Ji vowed to give his all in the fight for the Panth and for sovereignty. Sant Jarnail Singh gave Baba Gurbachan Singh a siropa and lovingly ordered him to return to his village and not return until summoned. Baba Ji knew this would be their final meeting. The attack took place and the Singhs defending Darbar Sahib became Shaheed after wreaking havoc on the Indian Army. Baba Gurbachan Singh knew that the “big seva” Sant Ji had spoken of was now at hand.